There are words that need to be said because they give weight to a moment so it makes sense. But often those words are hard, scary, or just too vulnerable, so we silence them and the moment weighs us down internally. 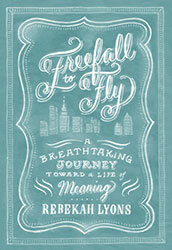 In her book, Freefall to Fly: A Breathtaking Journey Toward a Life of Meaning, Rebecca Lyons speaks those hard words — the ones that shout vulnerability and give way to possible rejection. However, in her words, I found comfort. I found a voice for things that I could never quite speak. Rebecca chronicles a time in her life where she moves from the comfort of a friendly Southern life complete with a large circle of friends, active church life, and safe neighborhood to New York City. With her husband and three kids in tow, her life does a complete 180 as she tries to adjust to the altogether different world. Simply being in the throes of young motherhood is complicated but when adding the stress of a new zip code, the complication only increases. She, like many other mothers, lost herself and those dreams she so intensely felt when she was younger. This book is about the often painful journey of losing yourself completely to the demands of life. I deeply enjoyed Rebecca’s ability to weave her story with lessons learned along the way. I identified with her on so many levels – in regards to those first years of motherhood and then again with being “lost” in a new world (hers, NYC and mine, missions). So often as women we feel we suffer alone with a pain no one else has experienced, but Rebecca shows us that honestly our sufferings bear a similar root – trying to find ourselves in the light of who God designed us to be. I finished the book feeling comforted, renewed, and challenged. This book is a great read for someone in the midst of motherhood, dramatic life change, or simply longing for the chance at a childhood dream. Words will be read that give voice to the silent sufferings, longings, and hopes that so few women even speak. In the end, readers will find joy in the free fall that gives them a chance to fly as the woman God intended for them to be. This entry was posted in Book Reviews and Recommendations, dreams, Spiritual Encouragement, Women's Issues and tagged Alicia C. Hall, Alicia Hall, book recommendations, books, reader on April 17, 2013 by aliciachall28.